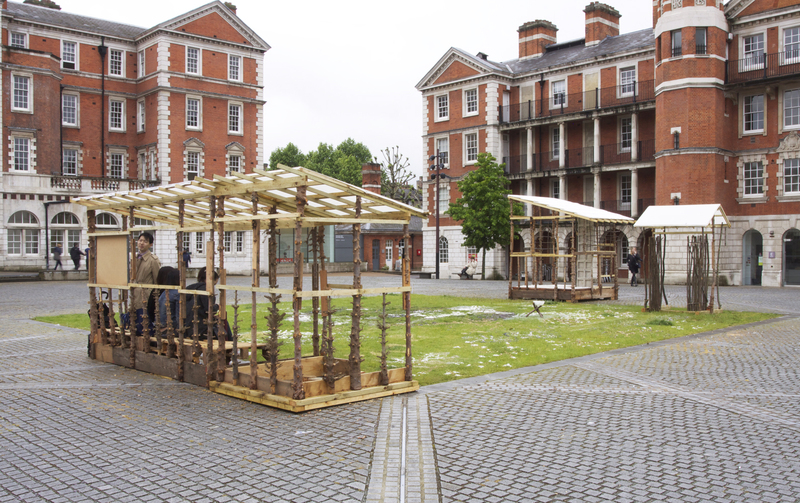 Students reconstructed a 17th century Kyoto garden, the Urasenke Konnich-an (今日庵) tea garden, in the Parade Ground of the college. 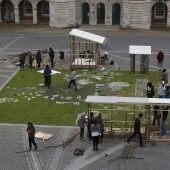 The garden complex was represented using a 1:1 measured ‘drawing’ and a series of full scale, selected, garden structures. We used the notion of ‘Primitive Hut’ described in the Essay on Architecture (1755) by Marc-Antoine Laugier, by employing recycled natural materials for the construction. The starting point for the construction was around 100 discarded Christmas trees collected from the 2013 festive season. The trees were cut, chiselled, and extended to form structural columns for the bench, toilet, gate and teahouse. All the details were developed through a series of workshops, using what is at hand because that is all that we had. 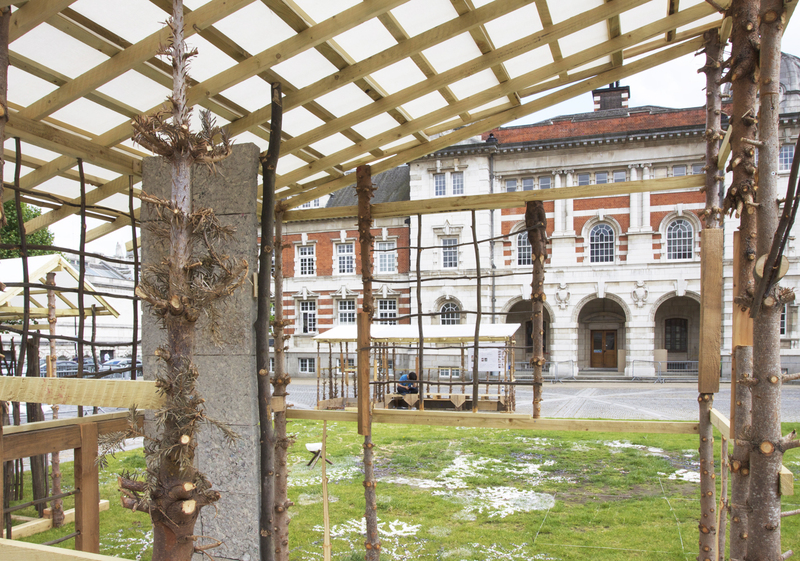 The resulting garden is a collage of collective thoughts, assembled together by the hands of students and tutors. 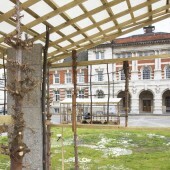 The construction of the tea garden was part of Chelsea Fringe, the alternative Garden Festival. Reference material for the project was kindly provided by Mr Kimura of Urasenke UK. ISD lecturer Shibboleth Shechter, architect Takeshi Hayatsu, self-building expert Mark McGlynn and Chelsea College of Arts 3D workshop. 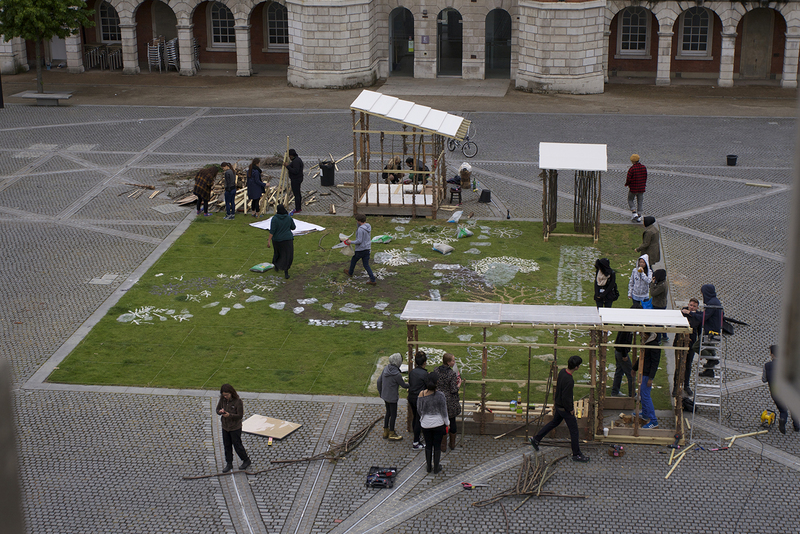 75 first year, Chelsea College of Arts Interior and Spatial Design students. Mitate is a kanji compound composed of the character 見, meaning “to see” or “to show”, and the character 立, meaning “to stand.” Literally “a new point of view.” Often used to describe something that surprises a viewer, sometimes a visual metaphor or allusion, or something that is not exactly what it seems. Coincidentally the word is close to the meaning of the English word ‘imitate’. 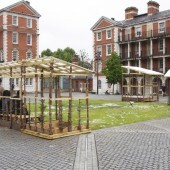 Through a series of models, drawings and 1:1 material experiments students explored how the original tea garden could be transformed and reconstructed in the parade ground of Chelsea College of Arts using the concept of ‘Mitate’.